A counterfeit copy of the world-famous Panaguyrishte gold treasure was found in a private home, police said. This is the first ever known counterfeiting example of the treasure, which is made of pure gold. Police said the prototype of a Panaguyrishte rhyton was made of a metal sheet covered by silver. The finding was made in a private house in the town of Svilengrad, on the southern border of Bulgaria. 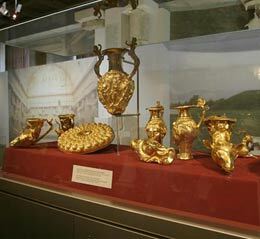 Made of 6.164 kg solid gold, it consists of a phial and eight rhytons, one shaped like an amphora and the others like heads of women or animals. The set outstanding with rich decoration was unearthed accidentally by three common workers in 1949. The biggest utensil is an Amphora rhyton. Seven utensils are rhyta (horn-shaped), three are in the shape of animal heads, one is like front part of he-goat's body, three are like women's heads, and one is phiale. It is dated to the last 3-4 decades of the 4th century B.C. Besides the counterfeit rhyton, police revealed also copies of old Bulgarian cup and Ottoman coins dated XV-XIX c. There were also numerous moulds for coins, icons, etc. A man aged 44 was arrested during the police raid, local Darik Radio informed.